Another week is down the drain in the race for the Senate, and while our overall outlook is unchanged — a five to eight seat gain for the GOP — some of our ratings are in need of adjustments. One of these comes as a surprise, as Sen. Kay Hagan (D-NC) is proving to be quite resilient. Several Democrats privately expressed to us earlier this year their pessimism about Hagan’s chances. They didn’t think she had the wherewithal and entrenched image of someone like Sen. Mary Landrieu (D-LA), who is a much more respected campaigner. But now those same Democrats, to their surprise, believe Hagan can now win. And we’ve seen a lot of polling, both public and private, indicating that she is ahead, though she’s closer to 45% than 50%, which is still tenuous territory for a Democratic incumbent in a Republican year. The problem for Republicans in the Tar Heel State is that Thom Tillis, their candidate and the speaker of the state House of Representatives, has particularly poor numbers for a challenger: His unfavorables are usually higher than his favorables, and not just by a few points. It’s not hard to imagine that a more generic Republican who is not tied to the unpopular state legislature — someone like Landrieu’s main challenger in Louisiana, nondescript Rep. Bill Cassidy (R) — would be doing better here. Hagan’s numbers aren’t great, either, though they appear to be improving: There’s some indication that her favorability is inching up to near an even split, meaning her favorability and unfavorability ratings would be about the same. And even though the president remains unpopular nationally, this state is several points more Democratic than Alaska, Arkansas, or Louisiana, three states where Democratic incumbents with deeper roots and better reputations as campaigners are in more trouble than Hagan is at the moment. President Obama’s not the drag here that he is in those states, though he is still a drag. For all these reasons, we’re moving North Carolina from Toss-up to Leans Democratic. We may be getting ahead of ourselves here. Remember: Hagan is really only at 45% or so, and even though there is a Libertarian in the race, Sean Haugh, who can pull votes from Tillis, his share of the vote appears to be decreasing from the high-single digits to the mid-single digits. Tillis still absolutely has a path to victory, but he seems stuck at the moment. One other change in favor of the Democrats: Polls continue to show Sen. Al Franken (D-MN) leading in his race against businessman Mike McFadden (R). While we believe the race will be closer than the polls currently indicate — the incumbent is up about 10 points — we are moving this race back to Likely Democratic, a move we suggested was on the horizon in our update last week. The Republicans are not without good news of their own this week, though. After winning his primary last week, former Massachusetts Sen. Scott Brown (R) is making a move in New Hampshire. Perhaps it’s just a consolidation of GOP support after the primary, but Brown is now only about four points behind Sen. Jeanne Shaheen (D). The best poll for Brown was one the political world woke up to on Monday morning from CNN/Opinion Research that showed him in a 48%-all tie. We cannot reiterate this enough: Trust the averages, not individual polls, although the CNN poll is of higher quality than many of the junk or partisan polls that get released on a daily basis. Yet even in that CNN poll — really the best public poll Brown has gotten all year — his favorability/unfavorability was still underwater with likely voters at 46%/48%. Shaheen, meanwhile, had a much stronger 54%/42% spread. We often mention how schizophrenic New Hampshire can be politically, swinging hard from one party to the other as the national mood changes. Well, perhaps we might see that here: President Obama’s approval rating in the poll was dreadful, with a 38%/60% approval/disapproval. Brown may have some baggage because of his carpetbagging, but he’s definitely a good enough candidate to win if conditions allow. And they just might. Furthermore, New Hampshire is a state where retail politicking matters, and Brown has an edge on Shaheen in that department. Shaheen is still the favorite here. But we’re moving the race from Likely Democratic to Leans Democratic. It’s worth noting that Democrats seem to have an advertising edge in many of the key Senate states at the moment, which might be artificially inflating their numbers in some of these races (kudos to Crystal Ball senior columnist Sean Trende for making this observation). The drag of an unpopular president, and the inherently Republican-leaning nature of many of the key states on this map, may yet boost the GOP from the low end of our range (a five-seat gain) to the high end (eight seats). The Republicans can lose New Hampshire and North Carolina — and also competitive blue states like Colorado and Iowa — and still win the Senate. Their most plausible path to the six-seat gain they need is capturing, in order of least to most difficult, Democratic-held Senate seats in Montana, West Virginia, South Dakota, Arkansas, Louisiana, and Alaska, which are all states where Obama got less than 42% of the vote in 2012. That route to a majority assumes they hold all of their present states, which might be too big of an assumption. Kansas is a potentially huge problem for the Republicans: Sen. Pat Roberts (R) is trying — perhaps not hard enough — to hang on to his seat against independent Greg Orman, and there’s growing indication that the race is tied, or that Orman may even be leading. We’re still calling the race Leans Republican but it may drift into Toss-up land soon. Gov. Tom Corbett (R-PA) has looked like a goner for a long time: We moved his race from Toss-up to Leans Democratic more than a year ago. We held it there after the primary because of Pennsylvania’s tradition of consistently giving each party two consecutive terms in the governor’s office (Corbett is just in his first party term) and because we wanted to see if there was any sign of movement in Corbett’s direction against his Democratic opponent, Tom Wolf. There hasn’t been. Wolf’s been up double digits in every single poll conducted since the primary. 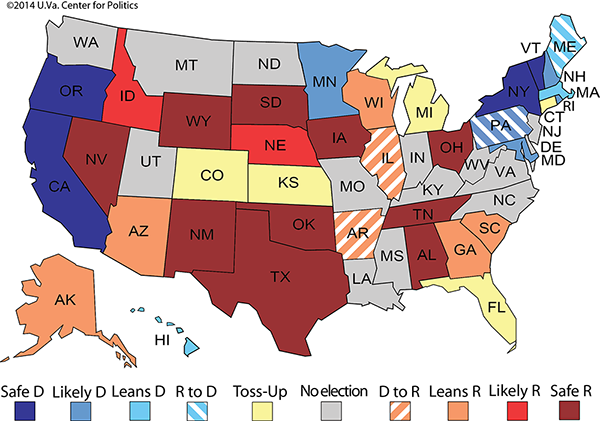 Corbett looks like a one-termer: We’re moving this race from Leans Democratic to Likely Democratic. Going the other way for Democrats is Colorado, where Gov. John Hickenlooper (D) appears to be in some real trouble against former Rep. Bob Beauprez (R). We previously thought that Hickenlooper would run ahead of his statewide ticketmate, Sen. Mark Udall (D), but now it appears he might run behind Udall — and Beauprez, too. Recently, Hickenlooper has taken heat for local issues — like potentially granting clemency to a convicted killer on death row and for gun restrictions passed last year that contributed to two Democratic state senators being recalled in 2013. Also, President Obama is very weak in the Centennial State, which hurts Hickenlooper and Udall, too. 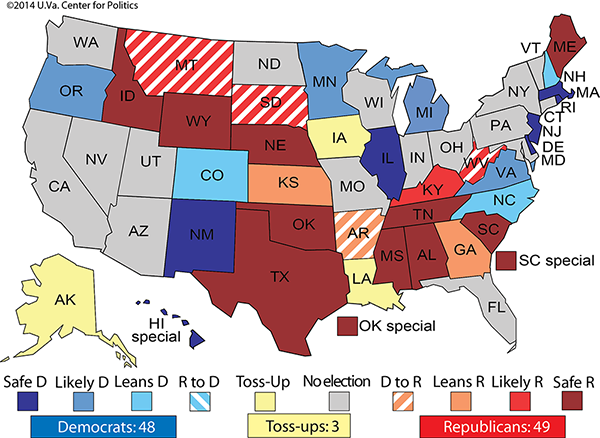 We’re keeping Udall at Leans Democratic, but moving Hickenlooper to Toss-up. One note: Many readers probably saw a Quinnipiac poll showing Beauprez up 10 points that was released on Wednesday morning. That survey reminds us of another Quinnipiac survey released almost exactly four years ago, showing John Kasich (R) beating then-Gov. Ted Strickland (D) in Ohio by 17 points. Kasich won, but only by two points. This poll also feels like an outlier, but others in the state have shown a close race. Two things worth remembering about Colorado: Recent polling there has often underestimated Democratic performance, and the state now has an all-mail voting system that should help Democratic turnout. Meanwhile, those looking for a sleeper race this year ought to take a look at Idaho. In his quest for a third term, Gov. Butch Otter (R) really struggled in his primary, getting only 51% of the vote, and we’ve heard from some sources there that he could be vulnerable. Apparently, Otter is having trouble unifying his party, and deep-pocketed challenger A.J. Balukoff, a conservative Democrat who said he voted for Mitt Romney in 2012, might give disaffected Republicans an alternative (a Libertarian is also running). Data here are scarce: There are only two public polls of which we are aware, which show Otter up an average of 51% to 35% over Balukoff. Based on that information, Otter is seemingly still in decent shape. However, because of what we’ve been hearing, we’re switching this race from Safe Republican to Likely Republican. Finally, Gov. Susana Martinez (R-NM) has long looked like a strong favorite despite New Mexico’s Democratic leanings, and Attorney General Gary King (D) does not appear capable of beating her. He has hardly any money and he just lost his third campaign manager, never a good sign for a campaign. This race moves from Likely Republican to Safe Republican. New Mexico joins Nevada and Ohio as two-time Obama states where first-term incumbent Republican governors are skating to victory. It’s certainly possible that Martinez will have some role to play on the national stage in her second term.